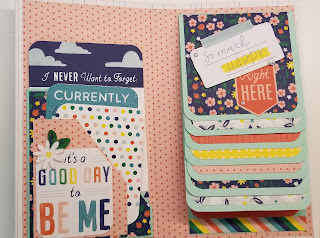 Welcome to the March Cross Canada blog hop where our paper pack of the month is So Much Happy! The colours in this paper pack really are happy! If you got here from Jessica's blog, you are in the right place, but it you get lost along the way, just head to Michelle's blog where you will find the complete list of bloggers. As you hop through our blogs, please leave a comment, whether to comment on our artwork, or to ask for information about something you see. We love to get your feedback. Now on to my blog. With the CTMH convention coming up in a few short months, I decided to get busy and make my roomie gifts. 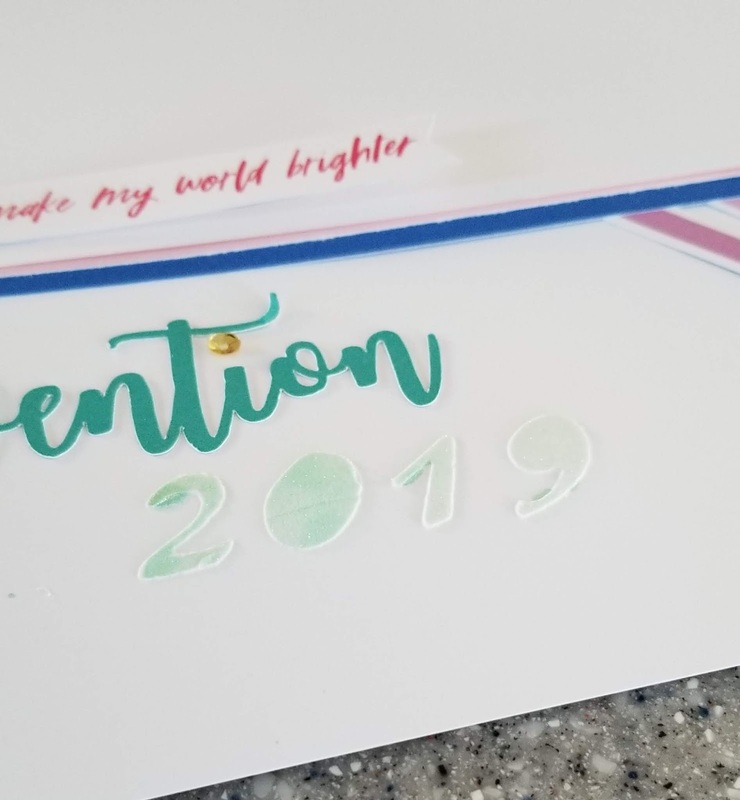 I made this little mini album for some memories of Convention 2019 - Celebrate! The mini is made from three pieces of chipboard - 2 @ 4.5" X 8.5" and 1 @ .75" X 8.5". The outer cover is 10.5" X 12" and the inside cover is 8 1/8" X 9 5/8". The waterfall is 7 pieces of cardstock cut at 4" X 4.5" and 15 pieces of patterned paper at 3.75" X 3.75". I made my own pockets and tags for the left side. The belly band is 1.5" X 12". There is about a 1" overlap for gluing. That's it for me this month. For more information about the So Much Happy paper pack and workshop kits, contact your local Close to my Heart consultant. Now hop over to Valerie's blog for some more great artwork! Who doesn't love a BOGO sale? Paper crafters everywhere can never have too much paper, so you are invited to a month-long Paper Party! Buy any paper packet this month and get another of equal or lesser value at 50% off! 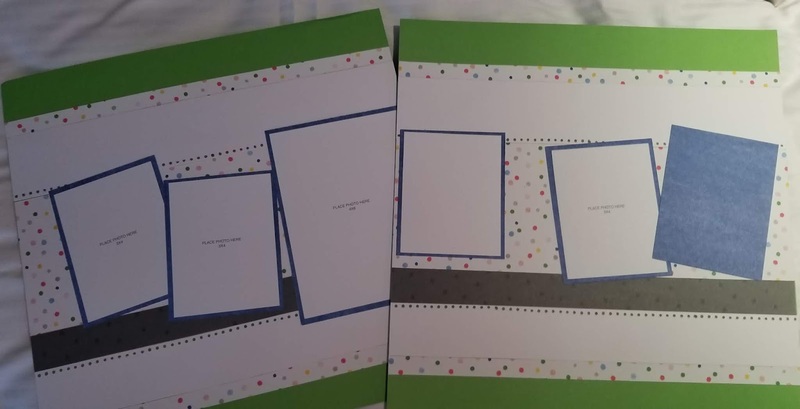 PLUS Close to my Heart has put together some awesome bundles that pair a paper packet with its coordinating cardstock. For those thinking of joining my Inky Pinky Scrappers team this month, and those who have a party that reaches the third level of Hostess Rewards, you can also get the Mix-in paper FREE! The Mix-In papers are so darned versatile. Use them to add just a bit more to any of your paper crafting projects. 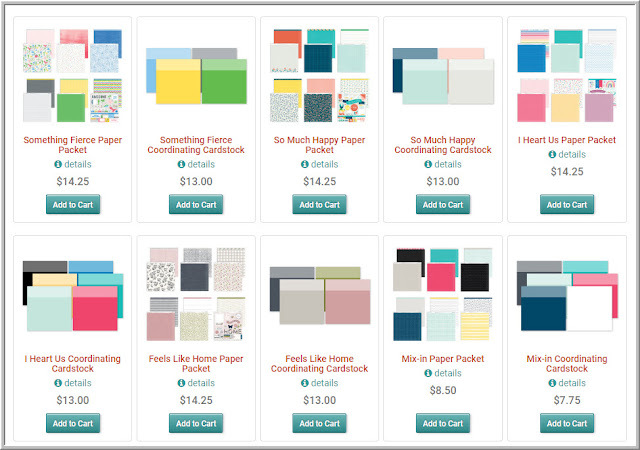 To order your paper packs and cardstock, just click the images below and you will be taken to my website. Thanks for stopping by and shopping with me today! Hope to see you again soon! 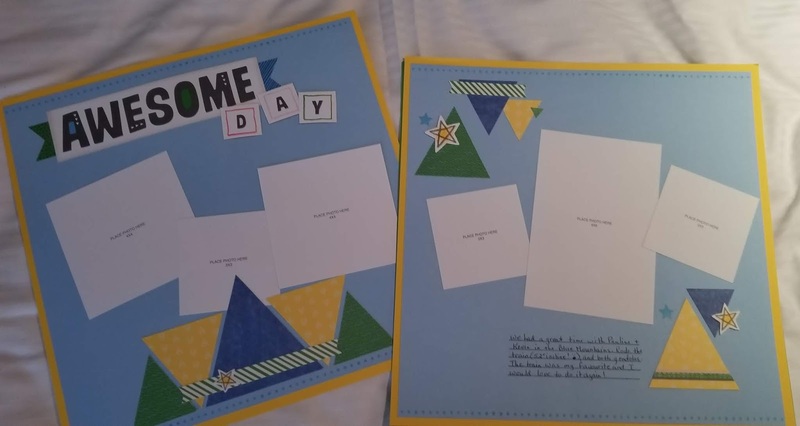 What better way to express appreciation and love than with handmade cards? Create the beautiful cards shown using the exclusive Love Blossoms stamp set and workshop bundle. Not only will you get a set of 12 cards, but you’ll also have fun using stamps and embossing folders to decorate them. 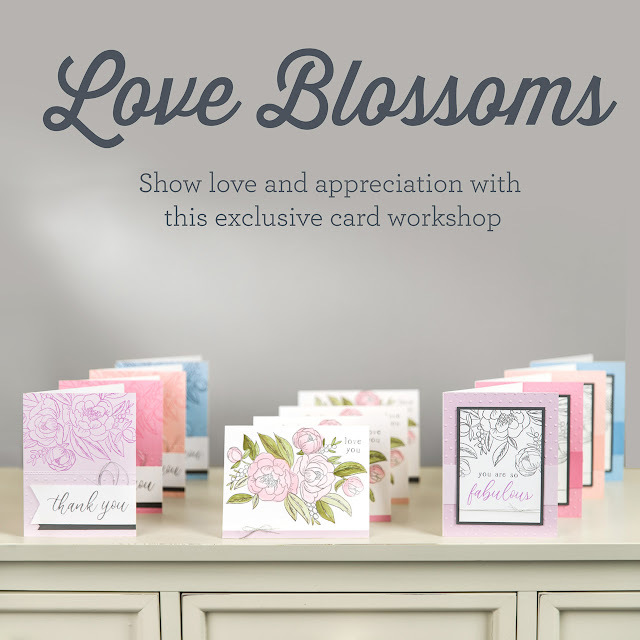 Get a 20% discount when you purchase the Love Blossoms Workshop Kit or the Love Blossoms Workshop Kit + Embossing Folder. The workshop kit features dry embossing techniques with the new Swiss Dot embossing folder with the pastel tones of Carolina, Lilac, Peach, and Pixie cardstock. The beautiful soft pastel shades make these cards beautiful inside and out and suitable for any occasion just by changing the sentiment. To order the Love Blossoms workshop for yourself or someone else, just click here and click the Promotions link in the menu bar. If you would like to hold a workshop in your home or mine, leave me a message and we can set it up! Welcome to the February Cross Canada Blog Hop. It is the month of love and what better theme than our I Heart Us kits! If you got here from Brandi's blog, you are in the right place, but if you get lost along the way, just head back to Michelle in Nova Scotia for the complete list of hoppers. As you go through our blogs, please leave your comments, whether it is to ask for more information, or to just tell us what you think. We enjoy reading what you have to say about our artwork. 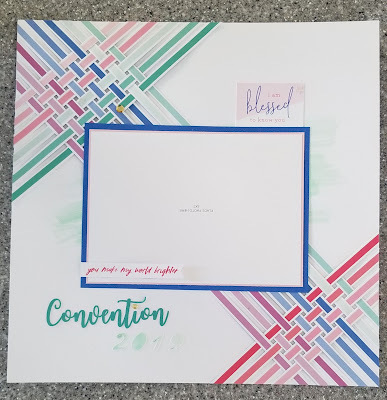 I love the colours in the I Heart Us papers and decided to do my take on one of the projects in the Deluxe Scrapbooking workshop. I plan on getting a photo of my buds and me at convention and will add it to the mats in the center. 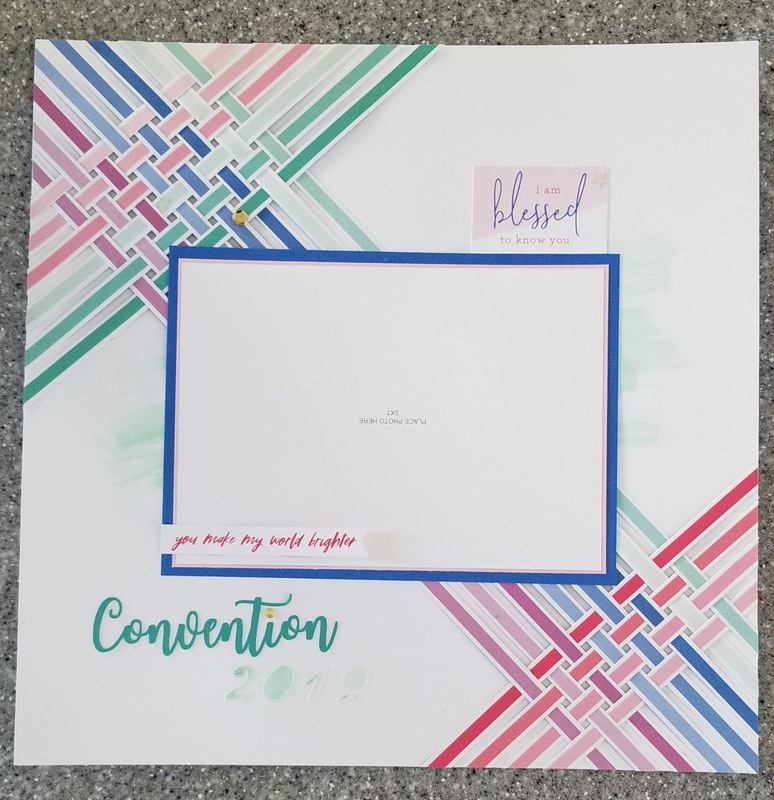 "Convention" is from the You Are Here Cricut cartridge and the 2019 is our new matte texture paste that I coloured with the Mint Shimmer Brush while it was still damp. The wash under the photo mats is several drops of the Mint Shimmer Ink that I added the tiniest bit of water to so the paper didn't warp too badly. Here is the "2019". I used my Cricut to cut the numbers out of a scrap piece of cardstock and used that as my stencil. That's it for me this month. If you have seen something here you would like more information about, please leave a comment and I will get back to you shortly! 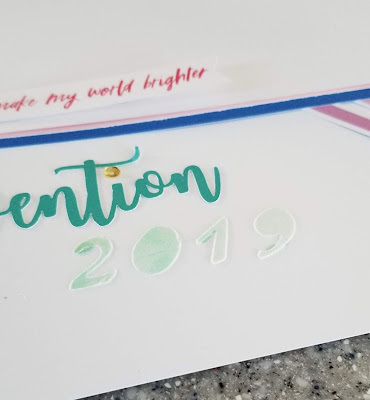 Come on by and join us again next month when our theme will be our So Much Happy papers and embellishments. Now head over to Valerie's blog for some more great artwork! See you next month! Welcome to our January 2019 Cross Canada Blog Hop and one of our new paper packs - Something Fierce! I love the dinosaur theme and the colours chosen for this paper! If you got here from Brandi's blog, you are on the right track, but if you get lost along the way, just head back to Michelle in Nova Scotia for the list of bloggers. As you hop through our blogs, please leave a comment. We love to get your input! Now, on with my blog. We have been on vacation in Australia and New Zealand since mid-November (home January 9) and one of the places we visited was the Blue Mountains. Since this area has plants that are unchanged since the time of the dinosaurs, there are dino statues everywhere. When I saw the dinos, I immediately thought of our new Something Fierce paper! Perfect! And I already had the layouts ready since we made them at the SE Launch! So here are my two layouts. I have added the journaling already so all I need to do is add my photos. I am not a pink person so I changed the colour scheme of this layout to greens. That's it for me this month. Please join us again next month when the theme will be I Heart Us. Now head on over to Kristin's blog for some more great artwork! It's October already! That means Thanksgiving on October 8. I hope you had plenty of turkey and all the goodies that go with it! This month, we are highlighting two paper packs - Grateful Heart and Hello Pumpkin. I have used the Grateful Heart paper for my project. If you got here from Terry Ann's blog, you are on the right track, but if you find you get lost along the way, just head back to Michelle in Nova Scotia where you will find the complete list of hoppers. As you make your way through the hop, please let us know what you think, whether it is a comment about the artwork or a request for information about the products or techniques used. Now, on to the hop. I love the Grateful Heart paper. The golds, oranges, and greens are true Fall colours, and although they are harbingers of the cold and nastiness to come, they are pretty. I made a little mini-album this month. I saw this on Pinterest originally posted by several different people and I thank whoever was the original poster for their instructions. I made a belly band to keep it closed and I think it looks pretty good. I wanted the front to have some decoration when the belly band was removed so added the leaves. Inside are two pockets on the left side where I have added tags made from the PML cards in the paper pack and other patterned paper and coordinating cardstock. At the bottom of the waterfall (under the last flap) is another pocket with a tag made from a PML card. That's it for me this month. As you go through the hop, please leave a comment about our artwork. If you see something you are interested in, please contact your local Close to my Heart consultant for more information. Please join us next month when the theme will be Christmas and the new Tis the Season paper pack. In the meantime, head over to Kristine's blog for some more great artwork!